With a stay at Scandic Sjöfartshotellet in Stockholm (Sodermalm), you'll be within a 15-minute drive of The Swedish Museum of Photography and Stockholm City Hall. Featured amenities include a business center, complimentary newspapers in the lobby, and dry cleaning/laundry services. Planning an event in Stockholm? This hotel has 3583 square feet (333 square meters) of space consisting of conference space and meeting rooms. Self parking (subject to charges) is available onsite. Located in Stockholm (Norrmalm), ApartDirect Sveavägen is within a 10-minute drive of Stockholm City Hall and Museum of Medieval Stockholm. 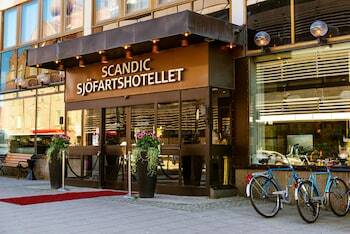 Located in Sollentuna, Ett smart hotell is within a 15-minute drive of Solvalla and Stockholm Quality Outlet Barkaby. Free self parking is available onsite.